Limit the activities such as (knee; bending, twisting and high impact). Try specific home exercises that can be performed to keep the muscles stronger. 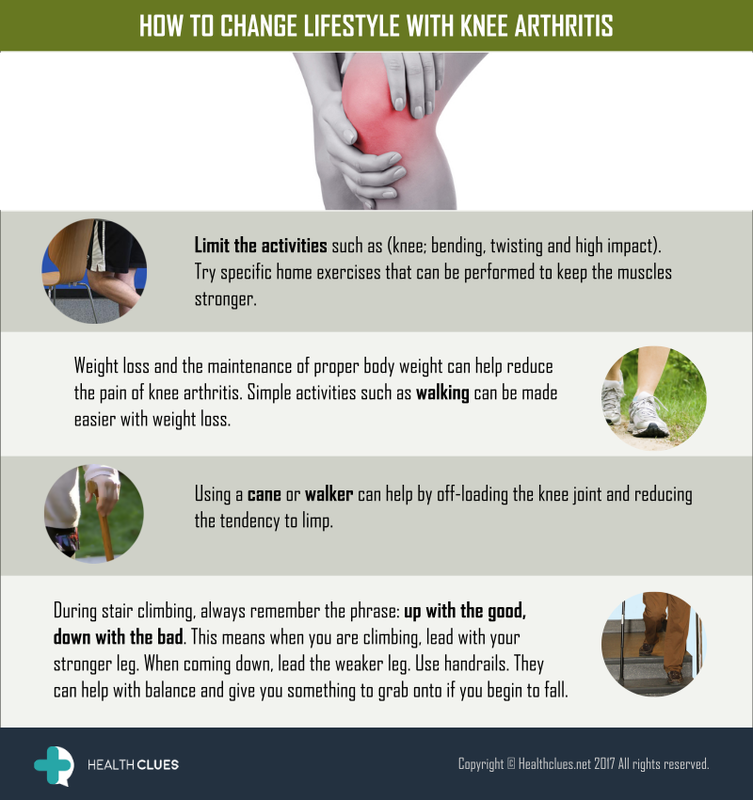 Weight loss and the maintenance of proper body weight can help reduce the pain of knee arthritis. Simple activities such as walking can be made easier with weight loss. Using a cane or walker can help by off-loading the knee joint and reducing the tendency to limp. During stair climbing, always remember the phrase: Up with the good, down with the bad. This means when you are climbing, lead with your stronger leg. When coming down, lead the weaker leg. Use handrails. They can help with balance and give you something to grab onto if you begin to fall. Infographics, Osteoarthritis, Rheumatoid Arthritis arthritis, knee arthritis, knee pain, osteoarthritis, rheumatoid arthritis. permalink.